The property has four bedrooms, two double beds and four single beds. It has parking for several cars, a large (heated - extra cost €20 per day) swimming pool, barbecue, and snooker. 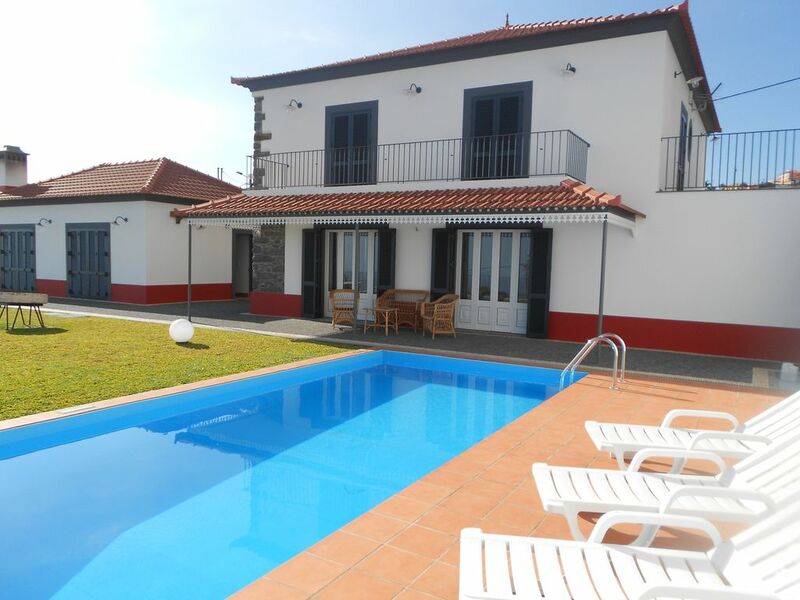 The property is roughly five minutes drive from the "Levada Nova" and ten minutes from "Paul da Serra", a place with many Levadas and beautiful landscapes. The nearest beach (Ponta do Sol) is localized a ten minute drive, Madalena do Mar beach twelve minutes and Calheta beach to fifteen minutes. The "Casa Pereira", although is in a quiet location, in secondary road but less than 150 meters from the main road, has about one kilometer health services, restaurants (less than two kilometers from the "Casa Pereira" we have at least four restaurants, including a pizzeria. One of them serves daily buffet), bank, supermarket and pharmacy. PT// O espaço é amplo e acolhedor. Inserido em zona calma e residencial, em estrada secundária mas a menos de 150 metros da estrada principal. A cerca de 1 km situam-se restaurantes, banco, farmácia, centro de saúde, supermercados, bomba de gasolina e bares. Os hóspedes terão acesso privado a todo o empreendimento, incluindo a piscina, churrasco e bilhar / snooker. A propriedade fica localizada a cerca de 5 minutos de carro da "Levada Nova" e a 10 minutos do "Paúl da Serra", um local com muitas levadas e lindas paisagens. A praia mais próxima (Ponta do Sol) fica localizada a 10 minutos de carro, a praia da Madalena do Mar a 12 minutos e a praia da Calheta a 15 minutos. ENG// My brother Sérgio and I are the owners of "Casa Pereira". We like a lot to receive people all over the world, as well as share experiences. We will be sure that you will be welcomed, because your satisfaction is our motivation! PT// O meu irmão Sérgio e eu somos os proprietários da "Casa Pereira". Nós gostamos imenso de receber pessoas de todo o mundo, pois assim partilhamos experiências. Teremos a certeza de que você será bem recebido, pois a sua satisfação é a nossa motivação! Duas casas de banho sociais e quatro privativas. A casa é fantástica, um autêntico refúgio onde é possível complementar bons momentos de descanso e divertimento. Eramos um grupo de 8 pessoas, 4 casais e ali passamos 3 dias extraordinários. Em primeiro lugar uma palavra de apreço para o Victor, extremamente atencioso quando nos recebeu e sempre disponível. Á nossa espera estava uma oferta de um cabaz de boas vindas com diversa fruta, água, leite, iogurtes, pão, manteiga, queijo, fiambre, uma caixa de chocolates e claro, uma sempre bem apreciada garrafa de vinho Madeira. Sem dúvida um grande anfitrião. A casa principal é composta por 4 quartos, cada um com a sua wc privada, algo muito valorizado por nós. No edifício principal também tínhamos uma ótima cozinha muito bem equipada bem como sala de jantar e estar com bons espaços. Na casa adjacente tínhamos um fantástico espaço de convívio e divertimento com uma bem apreciada mesa de bilhar, zona de churrasco espaçosa e bem equipada e ainda uma zona de estar com tv, ali passamos bons momentos. O exterior também excedeu as expectativas, com a excelente piscina e um espaço com relva muito bem tratada. Ótimas vistas tanto para as montanhas como para o mar. Em termos de privacidade merece uma excelente nota. De destacar também o espaço de estacionamento no interior da propriedade. De referir ainda, que as fotos a que tivemos acesso no site correspondem inteiramente à realidade encontrada na casa. Resumidamente, estamos a falar de uma casa muito bem conservada e cuidada, com excelentes condições para receber pessoas e nada de negativo temos a apontar, quanto muito algum facto positivo que tenha escapado neste comentário. Aconselhamos e recomendamos vivamente a Casa Pereira, sem dúvida uma fantástica experiência e temos intenção de voltar. Spacious and well appointed villa. Viktor was very welcoming and helpful. The villa was immaculate with lots of room for our extended family. It was well equipped and on arrival there were plenty of basic provisions and a few extras. The heating in the swimming pool was really appreciated and the games room a great bonus. Thank you dear Denise. It was a pleasure to welcome you. You were very friendly and careful with everything. We hope to receive you again. We are 2 families - 8 in total that have spent 10 days in Casa Pereira. The villa in short is a lovely place made up of a main house with 4 ensuite bedrooms plus balconies, lounge, laundry room along with a separate bathroom on the ground floor. In addition a great adjoining house with pool table, functioning barbecue and cable tv. The house has been been developed in recent years and is of high spec. Clean and considered - the pool and hilltop views make this a lovely place for a family or quiet holiday. There is a small supermarket up the hill along with chemist, bar and ATM. Its very quiet here. To highlight the villa is in a place called Canhas only a 5min drive ( if you are up for it as Maderia is essentially a mountain all roads are narrow and very steep) but can take over a hour to walk to Ponte de Sol. You are definitely out of the way here and will relay on taxi or the local bus service but is well positioned to reach Calheta and a 30 minute taxi/2hr bus drive ( which is fun) to Funchal. Victor left us generous provisions for our first night and gave us the number of a reliable taxi guy whom we used through out the holiday. Thank you dear Julie. It was a pleasure to welcome you. This property was just perfect for us - a french family of 2 adults and 2 teenagers. The house is fully equiped for 8 persons. Victor was very friendly and explained the history of the house when we arrived. He also offered a "welcome basket" with fruits, milk, water, beer, yogurt, bread, sweets, butter, ham and cheese ... and Madeira wine ! We enjoyed the swimming pool and the great views on the sea and the mountains. The "little" house next to the big one is very plaisant with a pool, a big TV screen and a huge barbecue. Shops are not far from the house. The location is perfect to discover some levadas of Madeira. We would warmly recommend this property ! Thank you for your comment and affection. We like a lot to get you on the property.You were very friendly and careful with everything. We hope to receive you again. Zona tranquila, em envolvente da natureza. A poucos minutos do Paul da Serra, local ideal para fazer caminhadas com paisagens deslumbrantes.